CERTA MAG is Jacksonville’s newest local magazine looking to shine some light on America’s largest city (land-wise) but with a New York City voice. 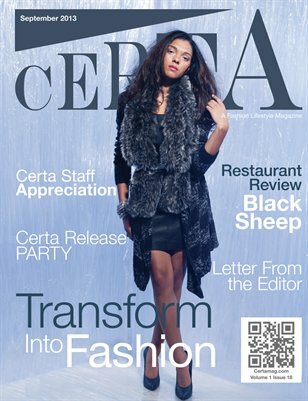 We here at CERTA want to give you, the reader, a little taste of everything from entertainment to food to local happenings around town. Whether you are a Jacksonville native or just passing through, we hope to give you a little taste of our great city, literally. Not only do we have a great variety of articles pertaining to the everyday woman, but we also offer a snapshot of the latest trends coming out of the world’s fashion capitals. Every city has their best kept secrets, and we here at CERTA are looking for just that.